So, the latest Dungeon Command set that I received in the mail is Curse of Undeath. Or, if you prefer, it's Dungeon Command: "The One with Zombies!" And, since I've already reviewed both Dungeon Command and the Dungeon Command: Tyranny of Goblins set, I'm going to assume you are familiar with the game. If not, I'd recommend that you read my Dungeon Command review, as this review will only focus on the Undead faction. My basic impression of the Undead faction is that I think that they might be the strongest faction thus far, but they are also the hardest to play. With all of the previously released factions, there is generally a single characteristic that almost all of the units have. However, this is not the case with the Undead. 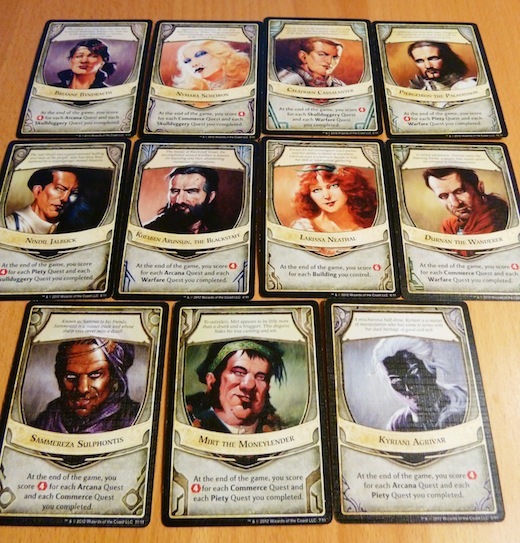 With the Undead, there is a fairly even breakdown of order cards between Constitution (13 cards), Charisma (11 cards), and Intelligence (9 cards). (There are also 3 "Any" cards.) And, to go along with these orders, the Undead are the most diversified when it comes to unit attributes; though most of the higher level units have multiple attributes (to make the Orders slightly easier to use). So, though the Undead have a lot of strong cards, the chances of you drawing cards that you can't play is also much higher. With that said, what all can the Undead do? Well, they seem to have a few themes among their cards - surround the enemy (or get surrounded), get a benefit when damaging units, and breaking the rules about summoning. Let's start with the swarming aspect of their cards. One of the new units is the "Skeletal Tomb Guardian." This Guardian makes a basic melee attack of 20, which isn't terribly impressive. But, whenever he makes a melee attack, he also does 20 damage to each other enemy creature he is adjacent to. Very nice! There are also at least three orders that get bonuses from having giant battles. "Death Grip" allows you to make a melee attack and add 10 damage for each other Undead creature that is surrounding your target. "Necrotic Howl" simply deals 10 damage to every enemy adjacent to the targeted creature (and is a Minor, so it doesn't even cost you an action). Finally, "Corrosive Blood" is a defensive card that allows you to prevent 10 damage and then deal 10 damage to each tapped creature adjacent to you. The next focus of the Undead is about getting a benefit when damaging units (after all, they do have vampires). First, of course, they have a vampiric unit - the "Vampire Stalker." And (I'm sure you're not surprised by this), the vampire is able to heal when he successfully inflicts damage. But, in addition to the vampire unit, there are also a couple of "Vampiric Touch" order cards that give a very similar effect - but they allow you to deal 30 damage and heal for 30 damage, instead of only healing for 10 (like the vampire). The last card that gets a bonus from dealing damage is the "Hulking Attack." This attack does a basic melee attack (with a 10 point bonus) but, if it is successful, it allows you to regain a morale, which is nice. The third "focus" of the Undead is really just a combination of one of the units and order cards - the "Lich Necromancer" with the "Call to Battle." The Lich Necromancer allows you to deploy Undead units adjacent to him when deploying. And, the Call to Battle attaches to a creature and allows you to deploy one creature during the action phase. Thus, this combination allows you to bring units into the fight directly from your hand, and just in time to attack. This is an incredibly powerful combination. The other two things that are powerful enough in the Undead faction that they warrant a mention are the giant undead bone dragon ("Dracolich") and the "Terrifying Revelation" (which, conveniently can be played by the Dracolich, since he is a level six unit with Charisma). The Dracolich has an ability that allows him to make three ranged attacks (of range 5 and 20 damage), as long as he is attacking a different target each time. And, the Terrifying Revelation simply forces a target opponent to lose three morale (which might be the most powerful order card that I've seen). Overall, I give Dungeon Command: Curse of Undeath an 8.5/10 (just like all of the other Dungeon Command sets). I think that it does a good job of expanding the game and adding new elements, and some of the order cards are worth using even if you don't want to use the Undead as your primary faction. If you like the Dungeon Command series, you might also check out Legend of Drizzt (since all of the minis are compatible with it), Mage Wars, and Nightfall. I would like to thank Wizards of the Coast for providing me with a review copy of Dungeon Command: Curse of Undeath. At GenCon 2011, I purchased a box of 3M titles at the auction. Honestly, I knew nothing about them and only bought them because I was interested in Feudal. Knowing that I might as well try them out, one of the other titles made me Jump (hehe)! 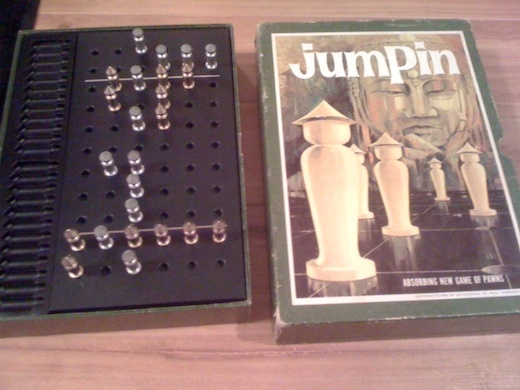 Jumpin was a spatial reasoning game! Excellent. 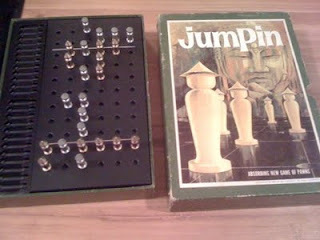 In Jumpin, each player controls a set of 12 pawns (lined up in two rows of six) that they are trying to move across the board into their opponent's starting zone. The twist to the game is that pieces may only move by jumping. They are allowed to jump over any number of pieces, can jump horizontally or vertically, can jump over any player's pieces, and they can "multi-jump" from one empty space to the next, as long as there remain pieces to jump over. The only thing that they cannot do is move a single space without jumping (or jump over multiple empty spaces). Players take turns selecting and jumping with a piece until one person has successfully moved all of his pieces across the board. Whoever successfully does this is declared the winner. The first thing that I like about Jumpin is that it is an abstract reasoning game, but it is unlike any of the other ones that I have played. (Yes, I have heard analogies to Chinese Checkers, but I believe that the inability to move a single piece truly sets Jumpin apart from even Chinese Checkers.) 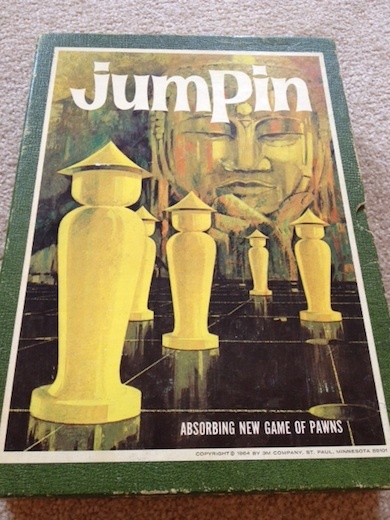 Moreover, if I played games that were similar to Jumpin, it would probably be because they borrowed mechanics from Jumpin, not the other way around (the copyright on the one I bought is 1964). My favorite element of all abstract reasoning games is that they challenge me to think in new and different ways, and the fact that Jumpin is so unlike anything that I have played is wonderful. The next thing that I like about Jumpin is the challenge that each player faces in navigating his pieces into his opponent's starting position. If there were simply a line that the pieces had to cross, and then they were removed from the board, then the game would be completely changed (and I think it would be much worse). However, once a player starts getting some of his pieces into his opponent's starting zone he is forced to pay attention to how he will successfully navigate his other pieces into the zone. Normally, the "easy" path that he has created will get blocked because of pieces that have already crossed - therefore, he will be forced to repeatedly readjust where his pieces are, thus costing extra moves. Whoever is able to anticipate this and plan accordingly will have a distinct advantage. One element of Jumpin that I haven't decided if I like is the fact that you can strand a pawn. If you jump away from a pawn, thus leaving it completely by itself, there is no way of moving that pawn unless you backtrack to it's location on a future turn, or if your opponent is kind (foolish) enough to move adjacent to it. For the most part, I have been able to avoid stranding pieces, as this was a trap that I very quickly noticed. The few times that I did strand a piece, I found it to be incredibly frustrating. And, the game is unforgiving enough that stranding a piece will most likely cost you the game against a good opponent. An unpleasant element that I noticed about Jumpin that I do not recall experiencing in other spatial reasoning games is that there feels like a lot of down time. 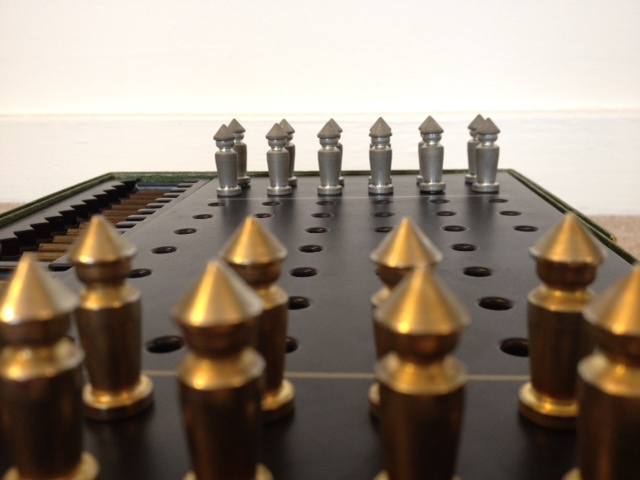 The game starts off fairly slowly as each player is simply jumping over one or two pieces. After a little while, the game really starts to get exciting as players will be able to jump their pawns across the entire game board in one or two moves. After this exciting phase, the game slows down again as the players are attempting to finalize their navigation into their victory area. I wish the game did not have these "slow" phases, but was able to maintain the feeling of excitement that it had in the middle of the game. My next con for Jumpin is that it feels much more like a race than a challenge against an opponent. In most spatial reasoning games, you are constantly facing decisions of whether to move in a way that benefits yourself, or move in a way that blocks your opponents. I think the best example of this is Abalone in which you feel like two sumo wrestlers attempting to move each other. However, in Jumpin, I rarely felt like what I did affected my opponent. Yes, he was able to jump over any of my pawns that I moved, so I would occasionally have to make sure that I did not help him with my movement. A few times I could even block a move that he was planning to make. For the most part, though, you will only be jumping over your own pieces, he will jump over his, and you will see who managed to race to the finish line faster. If Jumpin sounds interesting, you might also want to check out Pentago, Ingenious, and Stratum. Sunrise City is a recent tile-laying game by Clever Mojo Games, who also made the excellent and very popular Alien Frontiers. Tile laying is a widely-used mechanic, appearing in games as diverse as Taluva and Eclipse. The giant of the genre is certainly Carcassonne, and Sunrise City draws on this lineage while adding some neat new ideas. 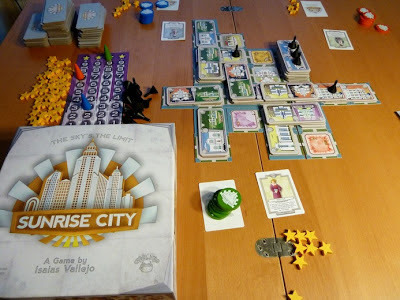 A game of Sunrise City is played over 3 rounds, each divided up into four phases. First, players draw zoning and building tiles and pick a unique role that will give them a special power until the next round. 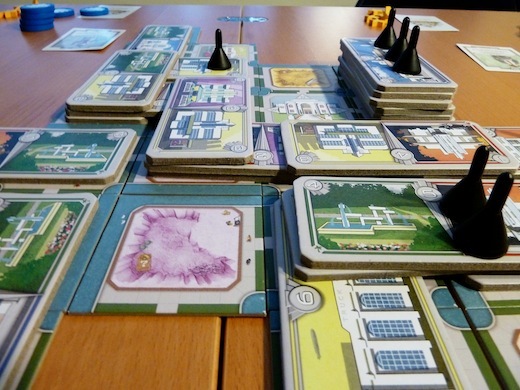 In the second phase, players place their zoning tiles on the table, extending the city outward. Then players bid on the right to build on the empty zones. Finally, in the building phase, players place their building tiles. Buildings can either go on zoning tiles that a player has won the right to build on in the bidding phase or on other buildings to create upper floors. They must always be placed on zones or other buildings that match their color (except for the purple “mixed use” zones and buildings). The color-matching requirement creates exciting tension as you hope the spots on which you can build will remain available. The scoring mechanic is a particular novelty of Sunrise City. As players earn points, they move up a 10-place track with a star at the top. Every time a player gets past the star, they earn a star-shaped “benchmark token” and loop around to the bottom. But a player who lands exactly on the star earns TWO benchmark tokens. The player with the most benchmark tokens at the end of the game wins, so a large part of the game’s strategy comes from maneuvering to land exactly at the top of the track and “double” your scoring. Points are scored every time a building is placed, but also in a variety of other ways. A player can earn points by placing a zoning tile next to another of the same type to create a “district”, by building next to the special “community” tiles, by building odd-numbered upper floors, or by a number of special powers on the role cards. Managing the various scoring methods to land exactly at 10 points is a fun challenge. Another wonderful aspect of this game is its components. The building tiles are the thickest pieces of cardboard I’ve ever seen in a game, and give you the feel of building a city in three dimensions. The pieces for bidding are thick wooden poker chips and the game includes large black plastic pieces for keeping track of the odd-floor scoring bonus - they look really neat on the city. Everything is bright and colorful, though there is one problem in that the blue on the buildings doesn’t perfectly match the blue on the zoning tiles. Happily, the zoning and building tiles also have icons corresponding to the colors. I do have one complaint about this game, which is the amount of luck. Depending on the tiles you are dealt, it simply may not be possible to get to exactly 10 points, potentially giving your opponents a major advantage. Luck can be a problem with any number of players. In the first round of one 3-player game, I drew two all-green building tiles, but there was only one green zone on the entire board. I ended up having to discard the tiles and miss this major point-scoring opportunity. In games with 4-players, there are more opportunities for scoring on any given turn, but it’s very hard to plan for landing on 10 points across multiple turns because your opponents will often cause you to score points during their turns. Since landing exactly at 10 points is so important, it would be nice to have more control over the scoring. classics like Carcassonne, especially since you draw 4 zoning tiles and 4 building tiles at the beginning of each turn, allowing for a little more planning. And building a large city in three dimensions is very satisfying. Overall, I think this is a nice game. It’s the best game I’ve played that uses tile laying as a central mechanic. If you like tile laying or are looking for a light-weight strategy game and don’t mind a bit of luck, you should definitely check it out. If Sunrise City sounds interesting, you might also check out Architekton, Carcassonne, and Cityscape. I would like to thank Clever Mojo Games for providing a review copy of Sunrise City. So, when I asked about time travel games on Twitter, my feed instantly became the Legacy: Gears of Time fan club. So... well, so I decided that I needed to try it! In Legacy: Gears of Time, each player represents a time architect that is attempting to invent and influence various technologies. The caveat is that many technologies depend on other technologies existing - for example, you cannot have the Internet without having Electricity. And so, influencing a technology that cannot possibly exist due to a historical contradiction is useless. The game consists of four rounds, with each round consisting of four turns per player. On each turn, you are allowed to take three actions. The actions can be moving back in time, drawing a card (you actually draw two and keep one), inventing a new technology, or adding influence to an existing technology. At the end of the round, everyone checks to see what historical contradictions occur - which technologies were "invented" multiple times, which ones are missing dependencies, and which ones have no influence. After checking this (and removing technologies as appropriate), players score points for each technology in which they have the most influence. And, each technology that is an immediate prerequisite for another technology scores again if the dependent technology scores. (For example, if the Internet scores, then the person that has the most influence on Electricity gets to score Electricity again.) Then, the influence on the technologies deteriorates, all the players go back to the "present" time, and you play another round. Whoever has the most points at the end of the fourth round wins the game! One of those Basic Tools is a fake! The first pro that I found for Legacy: Gears of Time are the historical contradictions. And, more specifically, how you are able to "affect" other players with these. (Yes, "affect" is the polite way of saying that you smack them in the face, steal their points, and then laugh. Laugh!!!) For example, if someone decides to invent Flight, then they are going to get several points of influence. And, if Space Flight is also invented, then Flight is suddenly one of the most valuable technologies in the game. However, if the player that invented Flight was not careful, then they might have inadvertently stolen credit! Because, really, I invented Flight in the era right before you "invented" Flight! And so your "Flight" is a fake! Ok, so I may have gotten a bit side-tracked reliving some memories. Either way, it is really fun to play an invention in an era earlier than where that invention currently exists - thus forcing the other invention to be destroyed. And (something I didn't mention earlier) after each round the eras are all allowed to hold one more invention. So, the game encourages you to do this. The next pro that I have for Legacy is that the influence on inventions (or "technologies" if you listen to the rule book) deteriorates. And, most fundamental inventions don't have much influence on them when you build them. This combination normally results in a mass chaos around round three in which most of the prerequisite inventions exist but without influence - and so, if nobody places influence on these inventions, then all of the better inventions are going to fail. This makes for some very interesting choices as you decide which of your inventions are most important, and thus which prerequisites are vital to your success. Or, if you don't have any of the later inventions, then you have to decide whether you want to influence some of the prerequisites (thus scoring a decent number of points but helping other players) or whether you want to use large piles of influence to steal credit for later inventions. Speaking of influence, my third pro for Legacy is how the Influence Pool works. To start the game, you have two influence in your pool. These are the only influence that you can spend on the "place influence on an existing technology" action. However, at the end of each round, when influence deteriorates, the player with the most influence on each successful technology puts the deteriorated influence in his Influence Pool. (Only the person with the most influence has one removed, and influence from contradictions and from failed technologies don't go to the Influence Pool.) Having a lot of influence available in your Influence Pool is very helpful, as it gives you flexibility with your actions - to steal credit for technologies, or to claim all of the useful prerequisites. So, you are further rewarded for controlling successful technologies. And, building a lot of fundamental technologies (instead of just a few advanced technologies) helps you in more than just total points. I thought that this was a really nice mechanic that made the game play very smoothly. The final pro that I will mention about Legacy is that I like that you can only move backwards on the timeline. (And then, at the end of the round, you return to Present Day.) At first, I was really uncertain about this mechanic, but as I played the game more, I really saw why it was very important. It forces you to plan out what you intend to do in the round before actually performing any actions. And, if you don't plan this out, then you generally won't be able to build any of the more advanced technologies. And yet, never being able to move forward adds an element of "chicken" to the game, where several players might stay in the present and draw cards, waiting to see who will move first - and what era they will move to. After all, you don't want to move back two eras and build Flight, just to see another time architect move back three eras and invent the same thing! With all that is right with Legacy: Gears of Time, one element of the game I'm still a bit uncertain about - so I will list it as a "point of note." This would be fate cards. Fate cards can be incredibly powerful. Many of them can be worth around 10-15 points if they are played correctly. One fate card allows a technology to ignore a specific prerequisite. This can make it much easier to score one of the advanced technologies like Space Flight or Genetics. Another fate card can move a time architect backwards or forwards one era on the timeline; this can be used to prevent an architect from adding influence to a critical technology - potentially costing them that technology and the one it depends on. (This can be over 20 points total!) So, the fate cards are incredibly powerful, and they add a bit of a "randomness" factor to the game. I think that if there were more of them, then the game might grow a bit too chaotic - whereas less of them might make the game a bit too rigid. But, overall, I'm not really sure how I feel about this element. And, now that I've convinced you that Legacy: Gears of Time is a great game, I guess it's time to balance that out a bit with some cons. First, if someone in your game really wants to calculate the best move at all times, then the game will slow down to a crawl. There are a lot of decisions to be made, and there is enough open information that, if someone wanted to, they could generally determine the best choice. For example, you can determine if it is more valuable to take credit for one of the specific prerequisites, and if so, which one. Or, should you add a new technology. Should you re-invent a prerequisite earlier in the timeline in order to take control of it? And, with all of this - which one? If you want to calculate this, then you have to look through all of the cards in the timeline, calculate up how many of them depend on that technology, and then repeat for the next one. And, while doing this, you have to factor in how many points you are giving to other players by allowing their advanced technology (or technologies) to score. Basically, there is enough going on that it can cause someone to unwittingly take drastically long turns if they are not intentionally trying to keep the game moving. The next con is somewhat similar. With all that is going on, scoring can be a bit fiddly. First, you have to determine which technologies are successful. Then, you have to check which ones are duplicated and remove them. Then, when scoring, you have to remember who controls each of the prerequisites, so that they can get points also. Then you have to deteriorate influence on everything, and make sure that those influence go back to the supply or to their owner's Influence Pool as appropriate. With practice, this element of the game will become a bit easier. But, some beginner advice will be - have only one person sticking their hand into the timeline. Have that person take off all of the duplicate technologies, then take all the Influence off of the failed technologies, and then off of the successful ones. This will help avoid questions like "did <my technology that I'm point to> get its influence removed yet?" Overall, I give Legacy: Gears of Time an 8.5/10. I was quite pleasantly surprised with this game, and, with multiple plays, I think that the cons will shrink, just leaving a bunch of pros. If you're looking for a game with interesting time travel mechanics, then you should definitely check it out. If Legacy: Gears of Time sounds interesting, you might also check out ARC and Innovation. I would like to thank Floodgate Games for providing me with a review copy of Legacy: Gears of Time. I would like to thank Chris C. for continuing to share insightful reviews (such as this one). Lords of Waterdeep is one of 2012’s breakout hits. It has impressed hobby gamers and newcomers alike with its combination of simple worker-placement mechanics and a Dungeons and Dragons theme. 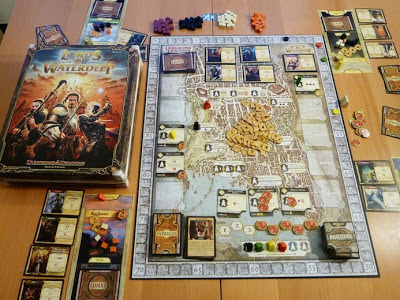 Waterdeep is a major city in the Forgotten Realms universe, and in this game each player is a member of the secret group of lords that run the city from the shadows. Each lord controls several agents that they will send out each turn to buildings around the city to recruit adventurers and gather money. These resources can be used to complete quests which earn players victory points, more resources, and occasionally special abilities that last for the remainder of the game. 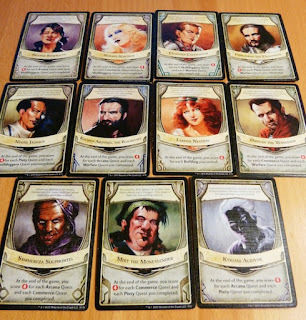 The game adds player interaction via “Intrigue Cards” which can be played by sending an agent to a particular building. These have a variety of purposes - some provide resources or allow players to steal from each other. The most interesting Intrigue Cards are “mandatory quests”, low-value quests that players can give to each other and which must be completed before any other quests. Buildings come in two varieties. There are nine “basic” buildings printed on the game board that will be available in every game. There is also a stack of building cards which is shuffled at the beginning of the game. Three of these cards are available at the “Builder’s Hall” at any time. Players may send an agent there and pay a building’s cost to put it into play, providing a new action space for everyone. They get a bonus for this: any time any other player uses the building to receive resources, they receive a smaller number of similar resources. Since different buildings are available each game, this adds variation and replayability. Players keep track of how many points they have earned from completing quests on a score track around the outside of the board. 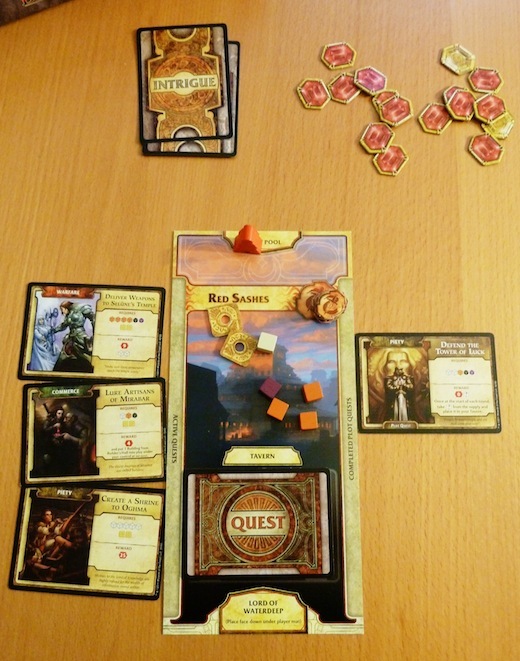 The game ends after 8 rounds, and players receive additional points for remaining resources. Additionally, each player reveals which lord card they are holding - most lords receive bonus points for completed quests of certain types. The quests come in five varieties (Arcana, Skullduggery, Commerce, Warfare and Piety) which tend to require different types of resources to complete. One lord receives bonus points for constructed buildings instead. quests. 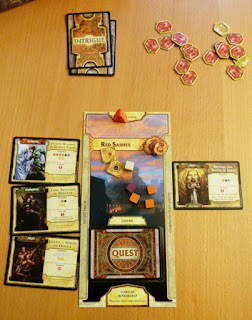 Players are at an advantage if they start with quests of the types that their lord gets bonus points for or if those quests are more frequently available. And players with quest types that require rarer resources are at the mercy of the building stack. More, the game is thematically disappointing. The “adventurers” recruited by your agents come in four types, Clerics, Warriors, Rogues and Wizards. But these are represented just by different colors of cubes. Quests require cubes of certain colors. Every group I’ve played with has begun asking for “orange cubes” instead of “warriors” within the first round or two. Even when I’ve tried to get people excited about reading the flavor text on their quests, it rarely lasts more than a turn. The theme feels entirely “pasted on”; it could be totally different and you wouldn’t notice because it boils down so directly into getting cubes of certain colors to meet the requirements on quest cards. I don’t want to be too harsh. The game is executed well and has no glaring mechanical flaws. The rulebook is clear and the production is fine (though I still wish for more exciting pieces). It actually makes an excellent introduction to worker placement games, since it’s mechanically so simple. I do bring it out with groups that aren’t ready for Agricola or don’t have time for a longer game. There are a few other games in this space - Stone Age is my go-to for simple worker placement mechanics, but I could definitely see picking Waterdeep instead if the group liked the theme better. Overall, this game is fun. But it doesn’t bring anything new to the table, doesn’t seem to have a lot of strategic depth, and the theme fails to engage the groups I’ve played it with. While Lords of Waterdeep doesn’t live up the hype surrounding it, it’s a fine game that would be worth picking up to fill the “simple worker placement” hole in your collection. If Lords of Waterdeep looks interesting, you might also check out Kingdom of Solomon, Le Havre, and Discworld: Ankh Morpork. Or, for a second opinion, check out Play Board Games' Lords of Waterdeep Review. I would like to thank Wizards of the Coast for providing a review copy of Lords of Waterdeep. A game that I've been excited to try for quite a while is Mage Wars. In Mage Wars, each player takes on the role of a mage with the goal of knocking out the opposing mage (in case you didn't get that from the title). To do this, each round both of the players "prepare" two spells from their spellbook (deck) by setting them aside - these are the only spells that the player will be able to play that round. After this, players will alternate taking actions with their creatures (mages and and any creature spells their mage had previously cast) until both players have run out of actions. (The mage gets a bonus action called a "quickcast" action that he can play amidst other actions.) When a creature takes an action, it can include moving and taking a quick action, or just taking a slow action. There are a lot of different quick actions, but some of them include casting certain spells, attacking (sometimes), moving again, "guarding" (becoming the target of attacks), and many other things. After both players run out of actions, they set everything back up, switch who starts the round, gain more mana, and pick new spells. Once one mage is knocked out, the game is over, and the other player wins. Mage Wars is really an interesting game, and I'm already finding it difficult to explain most of it. There is really a lot going on with the game, and this has translated into causing me difficulty in explaining it. So, really, as my first pro, I will mention that I think that there are layers of strategy in the game. The first time or two that you play it, you will be overwhelmed. So, you'll just be doing basic things - cast creatures, and charge forward. Or, cast some equipment with your mage, and cast giant fireball spells at your opponent. But, as you play it more, you realize some more things that you can do. In your next games, you might start guarding more. Or, you might explore damage barriers. As you've grown familiar with those, there are more options that you can start to use. After you have a lot of those things down, then you can explore the deck building options. Speaking of deck building options, this brings me to my second pro. I love the fact that they give you extra cards in the box. This is basically the exact opposite of how Fantasy Flight handles their card games. In Mage Wars, you have a lot of cards in the box that don't actually go into any of the base decks - they are only there for deck building purposes once you have mastered the basic game. Now, with that said, I really need to mention one of the things that greatly annoyed me about the game. There are four mages in the base game, and in the instructions, they tell you the cards to include in each of these mage's basic deck. However, there aren't enough cards in the base set to have all four of these decks built at the same time, so you're forced to constantly destroy and re-build their decks! This is awful and makes the setup time much longer than it should be. Fortunately, this leads back to a pro - Arcane Wonders (the company that made Mage Wars) actually listens to their fans! I wasn't the only one that hated this, and so they provided an altered version of the starting decks so that you can actually have all four of them built at the same time. If you're interested, you can see those decks here, under the "Updated Spell Lists" section. The next pro that I have for the game is that I thought that it brought some new and interesting mechanics to the fantasy skirmish genre. Specifically, I thought that the quickcast option and the enchantments were interesting. In Mage Wars, you don't really have an option of interrupting someone else's actions when they are performing them. The closest things that you can do are a quickcast action and an enchantment. You can only perform a quickcast action on your turn, but you can do this action before or after any other action that you perform (but only once per round). With an enchantment, you have to cast it on your turn, but when you cast it, you play it facedown. You may then immediately reveal the enchantment or wait until a later turn (either player's turn). When you reveal the enchantment, you have to pay its cost, but it is immediately in play and affects its target. So, if you see that your opponent is about to attack your mage, you can suddenly reveal an enchantment that will improve your defense. But, if you hadn't planned ahead, and you have no enchantments (or not enough mana to reveal the enchantment), then you just have to sit back and hope that your opponent rolls poorly. Now that I've covered my pros, there are a few things to mention about Mage Wars that are really just things that I think you should be aware of. First off, all damage is dealt with rolling lots of dice. This isn't terribly uncommon in strategy games, but it does present a situation where you might play the perfect combination of attack cards just to have the dice go against you and you miss entirely. Something that adds to this is that there is a "defense" ability in the game that allows you to completely avoid an attack. To determine if the defense allows you to avoid the attacker, you roll a die. So, though there is a lot of strategy in the game, the actual results will definitely be impacted by luck. The next thing that you need to be aware of is that every turn, you can select any two spells from your spellbook - not the two that are "in your hand." Because you don't have a hand of cards. You don't draw cards. They are all available from the beginning. This is really interesting, but it has some effects on the game. First, it means that whenever you teach the game to someone new, you better be prepared to entertain yourself for quite a while as they read through all of their spells. And, when they switch decks and use a different mage, you better be prepared to do it again. That problem goes away as you grow more familiar with the game. The greater concern that I have is whether there will be a ridiculous combination of cards that is discovered and it becomes the strategy that everyone uses. Obviously, there is nothing forcing anyone that plays Mage Wars to use one strategy over another, but I can see a situation where there are a group of cards that become the "standard" opening play for certain mages, just because they are so powerful. I haven't played the game enough to claim to know one of these strategies, but having seen all of the instant win combinations in Magic the Gathering (that only work if you draw the right cards), I do have some concerns. Last thing you should know before moving onto the cons - I hate Sleep. This isn't a con, because I'm not claiming that Sleep is overpowered. But, when someone casts Sleep on me, it makes me angry enough to want to throw things at them. I think that part of this is because in the basic decks there are very few counter cards; and so, if someone manages to cast sleep on me multiple times, there is very little I can do about it. They have basically removed one of my creatures from the game, unless I choose to attack my own creature to wake them up. Sleep angers me to even think about right now, so I should move on. With all that said, I do have a major con to Mage Wars. Teaching this game (or learning it for the first time) is ridiculous. I already mentioned that every spell in your spellbook is legal to play, so even if the game were incredibly simple, your first game would take quite a while. However, the game is not simple - it has 45 pages of rules. And, in those rules, the last 5 pages go over keywords that you will encounter on your cards. So, now instead of just reading through all of your cards, you're also having to look up what these cards do. I'm not saying that this makes Mage Wars a bad game. I am saying that I wish there were some way to avoid this, as it makes me never want to teach Mage Wars to anybody, but to only play it with my friends that already know how to play. I honestly believe that it will take 30-60 minutes before you start your first game of Mage Wars - if someone is teaching you. It will take even longer if you are learning it from the rulebook. And, in that first game, you will probably just be playing somewhat random spells in order to see what happens (and because you feel bad about making the game take so long). One of my friends likes to point out that everything in it "just makes sense," and so he claims that it's not that hard to learn. But, even with him teaching it, it still took me over 30 minutes to start playing. Be ready for this if you decide that you want to try Mage Wars. Overall, I give Mage Wars an 8.5/10. The game is actually pretty fun (when Sleep isn't being cast on you). I have some concerns that a "broken" strategy will emerge in the game (though I hate to use that term and I'm not saying that one currently exists), and I really have no interest in teaching it to new people. With that said, the games that I've played have been quite enjoyable, and I'd be interested in playing it some more. If you're interested in Mage Wars, you might also want to check out Summoner Wars, Dungeon Command, and Twilight Struggle. Or, if you're on the fence about it and want another opinion, check out Play Board Games' Mage Wars Review. I would like to thank Arcane Wonders for providing me with a review copy of Mage Wars. Today's review is of the latest game in the Fantasy Strike realm - Puzzle Strike: Shadows. Puzzle Strike: Shadows is basically the exact same game as Puzzle Strike (3rd Edition). If there were any rule changes, then I missed them completely. Essentially, Shadows is what you would get if you loved Puzzle Strike and hated all of the chips - so you threw them out (including characters) and replaced them. But kept everything else the same. And, well, I've already reviewed Puzzle Strike. 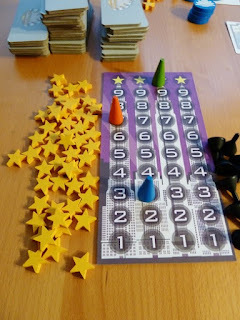 (If you missed it, here is a link to my Puzzle Strike 3rd Edition Review.) I also don't really feel like telling you the exact same thing that I've told you before. And yet, the fine people at Sirlin Games sent me this shiny box and asked me to write something about it. Where does that leave us? Well, I suppose it means that I should talk a bit about some of the chips that I thought were interesting. The first chips I will cover are character chips. Specifically Gwen's chips. To me, Gwen is the most unique character that I have seen in the Puzzle Strike chip set. Why? Because she punishes you for playing her! One of Gwen's chips is "Shadow Plague." Shadow Plague gives you a wound every time that you discard it (such as at the end of your turn - or if someone forces you to discard a chip). You can only get around this by spending an action. The other chips that Gwen has are much better. (And rightfully so! Otherwise nobody would ever purposely use Gwen.) One of them gives you an extra action, chip, and attack action (so you net an attack action), and the other gives you an extra brown action, two chips, and lets you force all of your opponents to discard a chip. Overall, Gwen is interesting, but I think that it takes an experienced player to actually use her well (which I am not - I did not do well when I played with her). The next character that I found interesting was Menelker. Why? Because Menelker has a chip that lets you remove a puzzle stack from the game. And, if there is already a puzzle stack removed from the game, then it re-emerges when you select a new stack. On the surface, this is neat but limited; once you remove your most hated stack from the game, then there's not really much use for the chip. But then, once you think about it for a minute, you realize that this is actually really powerful - you can remove the most powerful stack from the game, and then when you can afford to buy it, you can bring it back by sending a different stack out of the game! Thus, you are able to control access to the best puzzle chips. His other chips are also interesting. One of them forces each opponent to reveal his hand and discard his highest gem - fairly generic, but useful. His other action allows you to trash all 1's from his gem pile. Then, half of them are sent to an opponent (then the chip is trashed). This ccan be amazing - especially if you either don't use a lot of Combines, or if you've recently been crashed quite a bit (and thus you have a lot of ones in your gem pile). The third character I will mention is Quince. Quince's chips are really fairly unique. The first one is an ongoing chip, and it gives you an extra action and piggy-bank every turn. However, you must discard it at the start of your action phase if you have an odd number of chips. It's really interesting to see how long a player can keep this chip alive. His next chip allows him to pull two chips from his discard pile and show them to another player - who then gets to pick which one he can keep in his hand. And, Quince is allowed to play the newly scavenged chip this turn. So, you can try to force players to select your preferred chip by doing things like showing them a nasty attack and your desired chip - and assume they'll select the one that doesn't hurt them. Quince's final chip is another ongoing. If Quince's gem pile totals at least three, then no player is allowed to buy a chip that costs more than the total of their gem pile. This chip can grow very annoying; unless you're not doing well, in which case it hardly affects you! A bank chip that I found interesting was "Bang then Fizzle." Bang then Fizzle works with your gem pile, like Quince's chip. Specifically, you can only use it if your gem pile totals four or less. However, when you do get to use it, you get two extra actions and you get to draw two chips! This chip is incredibly powerful in the early game, but if you load up on too many of them, then you'll have a hand full of worthless chips later on. The last two chips that I will mention are both attacks. One is "Color Panic" and the other is "Just a Scratch." Color Panic is a fun one - it gives you an extra attack, and it allows you to name a color, and force every other player to discard a chip of that color if they can. If any of them can't, then you get an extra action. Nice. Just a Scratch gives you options. Either you can give each opponent a wound, or you can trash a wound from your hand or discard pile and play another attack. The second option is nice, because if your opponents are all jerks and play Just a Scratch, then you'll need to discard wounds. Of course, you can try to persuade them when you buy the chip that it's just to cleanup your bag, not to attack them; who knows, they might even believe you. With all that said, I give Puzzle Strike: Shadows an 8.5/10. Like I said, it's the same as Puzzle Strike. However, I like the basic Puzzle Strike chip set slightly better than this one (hence the slightly lower score). If you love Puzzle Strike, then picking up Shadows should be an obvious choice. If you're interested in Puzzle Strike and aren't sure which set you should buy, I'd encourage you to buy the basic set first - but part of that is because I think that everyone should have to carry around the giant bright pink box that it comes in. If Puzzle Strike: Shadows sounds interesting, you might also check out Nightfall, Thunderstone, and Pixel Lincoln. I would like to thank Sirlin Games for providing me with a review copy of Puzzle Strike: Shadows. It’s been a year since my mother in law has passed away. She ended up losing her fight with endometrial cancer. It was a long fight with a few years of remission, but when it came back it returned with gusto. It spread to the Liver and Bones. We enlisted the help of Hospice. What a wonderful organization. First the family does not pay for the service. What costs above insurance or Medicare is taken care of by the charitable side of hospice. The Goal of Hospice is to keep you as comfortable as possible during you final stages of a disease that will take your life. They try to keep you at home if they can, but if you are beyond staying at home and your area has one, they will move you to a Hospice house for your final days. To simply describe a Hospice house, think of it as the nicest nursing home you can think of. Then make it better. The rooms are very nice and clean. The staff is wonderful. 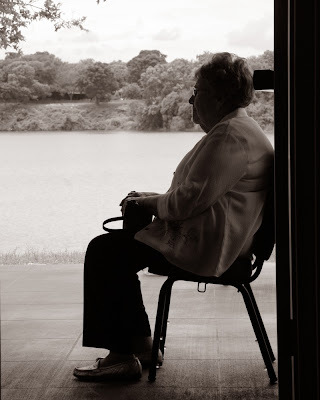 Often times a person moves to a Hospice house when they are in their final days or hours. The family has been called and it’s every body’s final hours with their loved ones. Everyone wants to stay as long as possible to be there. A Hospice house has large communal waiting areas. Hospice asks for volunteers for many things, one is to cook meals for the families that are waiting. Often there are kids that are there as well. For a kid hours and hours of waiting gets to be very boring and in these lounges is where they often go to get a way for a bit. Here is where you can help as a board gamer. If you have games you want rid of and you are contemplating a yard sale, donate those intact games to your Hospice house. Those rooms really need a selection of board games that are easy to pick up and fast to learn. Board gamers tend to also be thrift store shoppers. We are always on the lookout for that rare gem at the local thrift store. We pass over a Scrabble, Monopoly, Life game all the time. I suggest if they are cheap, good condition, and intact pick it up. Your Hospice house would be glad to have it in their lounge area. Being a gamer I took a box of games with us. My wife and I played Split for a few hours in my mother in laws room. It was a great distraction for us. I always keep some duplicate simple games in the box. When we left I gave those games to the Hospice. At first the lady behind the counter was confused. This is not a donation they normally get. I explained to them to add them to the Family lounges and she then got very appreciative. " I would like to thank Dale for sharing, and I must admit that I really think that I need to investigate the local Hospice Houses in my area, as I (like he mentioned) generally have extra games that aren't getting played. But, I was also quite surprised when he said that "the family does not pay for the service." Conveniently, I have a "close relationship" with someone that is very familiar with how Hospice services work (my wife used to work for a Hospice provider), and so I asked her about this. She said that, though Dale's situation isn't always the case, yes, regularly hospices will write-off any expenses beyond what insurance (Medicare, Medicaid, private insurance) will cover.